Kinetic Electrical Contracting Corp. is Staten Island’s trusted source for residential electrical repair, installation, inspections and more. We have been serving clients in this community for 28 years and are proud to have provided 100% satisfaction to over 5,900 customers! Whether you own your own home, are a first-time renter or are in charge of caring for a large residential property, you understand the importance of reliable, functional and safe electricity for a whole host of daily activities. When you have a problem with your electricity, you need a team that you can turn to for help, one that you can trust to put things right. Since 1988, customers in need of a residential electrician in Staten Island, NY have trusted Kinetic Electrical Contracting Corp. to provide the electrical repair and maintenance services they need, 24/7. 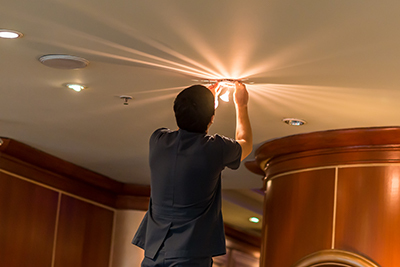 We are full service residential electricians who can handle all types of projects, from lighting installation and general repairs to new construction projects and remodels. We’re a locally owned and operated business serving Staten Island, NY since 1988. We’re fully licensed by New York City and have master electrician status. We offer 24/7 emergency repair service for your protection and peace of mind. Our rates are competitive and honest. Reach out to Kinetic Electrical Contracting Corp. today for any residential electrical need. We’re available 24/7 for emergencies!